"American Communists" redirects here. For other uses, see Communist Party USA (disambiguation). The Communist Party USA, officially the Communist Party of the United States of America (CPUSA), is a communist party in the United States established in 1919 after a split in the Socialist Party of America following the Russian Revolution. The CPUSA has a long and complex history that ties closely with the American labor movement and communist parties worldwide. Initially operating underground due to the Palmer Raids starting in the First Red Scare, the party was influential in American politics in the first half of the 20th century and played a prominent role in the labor movement from the 1920s through the 1940s, becoming known for opposing racism and racial segregation after sponsoring the defense for the Scottsboro Boys in 1931. Its membership increased during the Great Depression, and they played a key role in the Congress of Industrial Organizations. The CPUSA subsequently declined due to events such as the second Red Scare and the influence of McCarthyism. Its opposition to the Marshall Plan and the Truman Doctrine were unpopular, with its endorsed candidate Henry A. Wallace under-performing in the 1948 presidential election, while its support for the Soviet Union increasingly alienated it from the rest of the left in the United States in the 1960s. The CPUSA received significant funding from the Soviet Union and crafted its public positions to match those of Moscow. The CPUSA also used a covert apparatus to assist the Soviets with their intelligence activities in the United States and utilized a network of front organizations to shape public opinion. The CPUSA opposed glasnost and perestroika in the Soviet Union and as a result major funding from the Communist Party of the Soviet Union ended in 1989. The party remains committed to Marxism–Leninism. For the first half of the 20th century, the Communist Party was a highly influential force in various struggles for democratic rights. It played a prominent role in the labor movement from the 1920s through the 1940s, having a major hand in founding most of the country's first industrial unions (which would later use the McCarran Internal Security Act to expel their Communist members) while also becoming known for opposing racism and fighting for integration in workplaces and communities during the height of the Jim Crow period of racial segregation. Historian Ellen Schrecker concludes that decades of recent scholarship offer "a more nuanced portrayal of the party as both a Stalinist sect tied to a vicious regime and the most dynamic organization within the American Left during the 1930s and '40s". It was also the first political party in the United States to be racially integrated. By August 1919, only months after its founding, the Communist Party claimed 50,000 to 60,000 members. Members also included anarchists and other radical leftists. At the time, the older and more moderate Socialist Party of America, suffering from criminal prosecutions for its antiwar stance during World War I, had declined to 40,000 members. The sections of the Communist Party's International Workers Order (IWO) organized for communism around linguistic and ethnic lines, providing mutual aid and tailored cultural activities to an IWO membership that peaked at 200,000 at its height. Subsequent splits within the party have weakened its position. During the Great Depression, many Americans became disillusioned with capitalism and some found communist ideology appealing. 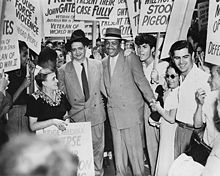 Others were attracted by the visible activism of Communists on behalf of a wide range of social and economic causes, including the rights of African Americans, workers and the unemployed. The Communist Party played a significant role in the resurgence of organized labor in the 1930s. Still others, alarmed by the rise of the Falangists in Spain and the Nazis in Germany, admired the Soviet Union's early and staunch opposition to fascism. Party membership swelled from 7,500 at the start of the decade to 55,000 by its end. Party members also rallied to the defense of the Spanish Republic during this period after a nationalist military uprising moved to overthrow it, resulting in the Spanish Civil War (1936–1939). The Communist Party of the Soviet Union, along with leftists throughout the world, raised funds for medical relief while many of its members made their way to Spain with the aid of the party to join the Lincoln Brigade, one of the International Brigades. However, the Communist Party's early labor and organizing successes did not last. As the decades progressed, the combined effects of the second Red Scare, McCarthyism, Nikita Khrushchev's 1956 "Secret Speech" denouncing the previous decades of Joseph Stalin's rule and the adversities of the continued Cold War mentality, steadily weakened the party's internal structure and confidence. 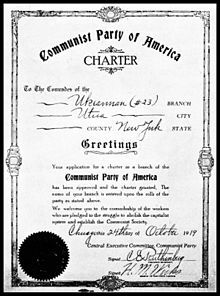 Party membership in the Communist International and its close adherence to the political positions of the Soviet Union made the party appear to most Americans as not only a threatening, subversive domestic entity, but also as a foreign agent fundamentally alien to the American way of life. Internal and external crises swirled together, to the point where members who did not end up in prison for party activities tended either to disappear quietly from its ranks or to adopt more moderate political positions at odds with the party line. By 1957, membership had dwindled to less than 10,000, of whom some 1,500 were informants for the FBI. The party was also banned by the Communist Control Act of 1954, which still remains in effect although it was never really enforced. The party attempted to recover with its opposition to the Vietnam War during the civil rights movement in the 1960s, but its continued uncritical support for an increasingly stultified and militaristic Soviet Union increasingly alienated it from the rest of the left-wing in the United States, which saw this supportive role as outdated and even dangerous. At the same time, the party's aging membership demographics and calls for "peaceful coexistence" failed to speak to the New Left in the United States. With the rise of Mikhail Gorbachev and his effort to radically alter the Soviet economic and political system from the mid-1980s, the Communist Party finally became estranged from the leadership of the Soviet Union itself. In 1989, the Soviet Communist Party cut off major funding to the American Communist Party due to its opposition to glasnost and perestroika. With the dissolution of the Soviet Union in 1991, the party held its convention and attempted to resolve the issue of whether the party should reject Marxism–Leninism. The majority reasserted the party's now purely Marxist outlook, prompting a minority faction which urged social democrats to exit the now reduced party. The party has since adopted Marxism–Leninism within its program. In 2014, the new draft of the party constitution declared: "We apply the scientific outlook developed by Marx, Engels, Lenin and others in the context of our American history, culture, and traditions". The Communist Party is based in New York City. From 1922 to 1988, it published Morgen Freiheit, a daily newspaper written in Yiddish. For decades, its West Coast newspaper was the People's World and its East Coast newspaper was The Daily World. The two newspapers merged in 1986 into the People's Weekly World. The People's Weekly World has since become an online only publication called People's World. The party's former theoretical journal Political Affairs is now also published exclusively online, but the party still maintains International Publishers as its publishing house. In June 2014, the party held its 30th National Convention in Chicago. [S]truggle for the unity of the working class, against all forms of national oppression, national chauvinism, discrimination and segregation, against all racist ideologies and practices, [...] against all manifestations of male supremacy and discrimination against women, [...] against homophobia and all manifestations of discrimination against gays, lesbians, bisexuals, and transgender people. Among the points in the party's "Immediate Program" are a $15/hour minimum wage for all workers, national universal health care and opposition to privatization of Social Security. Economic measures such as increased taxes on "the rich and corporations", "strong regulation" of the financial industry, "regulation and public ownership of utilities" and increased federal aid to cities and states; opposition to the Iraq War and other military interventions; opposition to free trade treaties such as the North American Free Trade Agreement (NAFTA); nuclear disarmament and a reduced military budget; various civil rights provisions; campaign finance reform including public financing of campaigns; and election law reform, including instant runoff voting. The Communist Party emphasizes a vision of socialism as an extension of American democracy. Seeking to "build socialism in the United States based on the revolutionary traditions and struggles" of American history, the party promotes a conception of "Bill of Rights Socialism" that will "guarantee all the freedoms we have won over centuries of struggle and also extend the Bill of Rights to include freedom from unemployment" as well as freedom "from poverty, from illiteracy, and from discrimination and oppression". Many myths have been propagated about socialism. Contrary to right-wing claims, socialism would not take away the personal private property of workers, only the private ownership of major industries, financial institutions, and other large corporations, and the excessive luxuries of the super-rich. Rather than making all wages entirely equal, the Communist Party holds that building socialism would entail "eliminating private wealth from stock speculation, from private ownership of large corporations, from the export of capital and jobs, and from the exploitation of large numbers of workers". Millions of workers are unemployed, underemployed, or insecure in their jobs, even during economic upswings and periods of 'recovery' from recessions. Most workers experience long years of stagnant and declining real wages, while health and education costs soar. Many workers are forced to work second and third jobs to make ends meet. Most workers now average four different occupations during their lifetime, many involuntarily moved from job to job and career to career. Often, retirement-age workers are forced to continue working just to provide health care for themselves and their families. Millions of people continuously live below the poverty level; many suffer homelessness and hunger. Public and private programs to alleviate poverty and hunger do not reach everyone, and are inadequate even for those they do reach. With capitalist globalization, jobs move from place to place as capitalists export factories and even entire industries to other countries in a relentless search for the lowest wages. The Communist Party believes that "class struggle starts with the fight for wages, hours, benefits, working conditions, job security, and jobs. But it also includes an endless variety of other forms for fighting specific battles: resisting speed-up, picketing, contract negotiations, strikes, demonstrations, lobbying for pro-labor legislation, elections, and even general strikes". The Communist Party's national programs considers workers who struggle "against the capitalist class or any part of it on any issue with the aim of improving or defending their lives" part of the class struggle. The Communist Party maintains that developments within the foreign policy of the United States—as reflected in the rise of neoconservatives and other groups associated with right-wing politics—have developed in tandem with the interests of large-scale capital such as the multinational corporations. The state thereby becomes thrust into a proxy role that is essentially inclined to help facilitate "control by one section of the capitalist class over all others and over the whole of society". Accordingly, the Communist Party holds that right-wing policymakers such as the neoconservatives, steering the state away from working-class interests on behalf of a disproportionately powerful capitalist class, have "demonized foreign opponents of the U.S., covertly funded the right-wing-initiated civil war in Nicaragua, and gave weapons to the Saddam Hussein dictatorship in Iraq. They picked small countries to invade, including Panama and Grenada, testing new military equipment and strategy, and breaking down resistance at home and abroad to U.S. military invasion as a policy option". From its ideological framework, the Communist Party understands imperialism as the pinnacle of capitalist development: the state, working on behalf of the few who wield disproportionate power, assumes the role of proffering "phony rationalizations" for economically driven imperial ambition as a means to promote the sectional economic interests of big business. In opposition to what it considers the ultimate agenda of the conservative wing of American politics, the Communist Party rejects foreign policy proposals such as the Bush Doctrine, rejecting the right of the American government to attack "any country it wants, to conduct war without end until it succeeds everywhere, and even to use 'tactical' nuclear weapons and militarize space. Whoever does not support the U.S. policy is condemned as an opponent. Whenever international organizations, such as the United Nations, do not support U.S. government policies, they are reluctantly tolerated until the U.S. government is able to subordinate or ignore them". Thousands of grassroots peace committees [were] organized by ordinary Americans [...] neighborhoods, small towns and universities expressing opposition in countless creative ways. Thousands of actions, vigils, teach-ins and newspaper advertisements were organized. The largest demonstrations were held since the Vietnam War. 500,000 marched in New York after the war started. Students at over 500 universities conducted a Day of Action for "Books not Bombs." Over 150 anti-war resolutions were passed by city councils. Resolutions were passed by thousands of local unions and community organizations. Local and national actions were organized on the Internet, including the "Virtual March on Washington DC" [...]. Elected officials were flooded with millions of calls, emails and letters. In an unprecedented development, large sections of the US labor movement officially opposed the war. In contrast, it took years to build labor opposition to the Vietnam War. [...] For example in Chicago, labor leaders formed Labor United for Peace, Justice and Prosperity. They concluded that mass education of their members was essential to counter false propaganda, and that the fight for the peace, economic security and democratic rights was interrelated. The party has consistently opposed American involvement in the Korean War, the Vietnam War, the First Gulf War and the post-September 11 conflicts in both Iraq and Afghanistan. The Communist Party does not believe that the threat of terrorism can be resolved through war. The Communist Party Constitution defines the working class as a class which is "multiracial, multinational, and unites men and women, young and old, employed and unemployed, organized and unorganized, gay and straight, native-born and immigrant, urban and rural, and composed of workers who perform a large range of physical and mental labor – the vast majority of our society". The Communist Party seeks equal rights for women, equal pay for equal work and the protection of reproductive rights, together with putting an end to sexism. The party's ranks include a Women's Equality Commission, which recognizes the role of women as an asset in moving towards building socialism. Historically significant in American history as an early fighter for African Americans' rights and playing a leading role in protesting the lynchings of African Americans in the South, the Communist Party in its national program today calls racism the "classic divide-and-conquer tactic". From its New York City base, the Communist Party's Ben Davis Club and other Communist Party organizations have been involved in local activism in Harlem and other African American and minority communities. The Communist Party was instrumental in the founding of the progressive Black Radical Congress in 1998. Historically significant in Latino working class history as a successful organizer of the Mexican American working class in the Southwestern United States in the 1930s, the Communist Party regards working-class Latino people as another oppressed group targeted by overt racism as well as systemic discrimination in areas such as education and sees the participation of Latino voters in a general mass movement in both party-based and nonpartisan work as an essential goal for major left-wing progress. The Communist Party holds that racial and ethnic discrimination not only harms minorities, but is pernicious to working-class people of all backgrounds as any discriminatory practices between demographic sections of the working class constitute an inherently divisive practice responsible for "obstructing the development of working-class consciousness, driving wedges in class unity to divert attention from class exploitation, and creating extra profits for the capitalist class". The Communist Party supports an end to racial profiling. The party supports continued enforcement of civil rights laws as well as affirmative action. The Communist Party notes its commitment to participating in environmental movements wherever possible, emphasizing the significance of building unity between the environmental movement and other progressive tendencies. Various approaches blame the victims. Supposedly the only solution is to change individual consumer choices, since people in general are claimed to cause the problem. But consumers, workers, and poor people don't have any say in energy plant construction, in decisions about trade or plant relocation or job export, in deciding on tax subsidies to polluting industries like the oil industry. Supporting cooperation between economically advanced and less economically developed nations in the area of environmental cooperation, the Communist Party stands in favor of promoting "transfer from developed countries to developing countries of sustainable technology, and funds for capital investment in sustainable agriculture, energy, and industry. We should support efforts to get the developed nations to make major contributions to a fund to protect the rainforests from devastation". The Communist Party opposes drilling in the Alaska National Wildlife Refuge, the use of nuclear power until and unless there is a safe way to dispose of its waste and it conceives of nuclear war as the greatest possible environmental threat. The Communist Party is not against religion, but instead regards positively religious people's belief in justice, peace and respectful relations among peoples. To build good relations with supporters of religion, the party has its own Religious Commission. The Communist Party garnered support in particular communities, developing a unique geography. Instead of a broad nationwide support, support for the party was concentrated in different communities at different times, depending on the organizing strategy at that moment. Before World War II, the Communist Party had relatively stable support in New York City, Chicago and St. Louis County, Minnesota. However, at times the party also had strongholds in more rural counties such as Sheridan County, Montana (22% in 1932), Iron County, Wisconsin (4% in 1932), or Ontonagon County, Michigan (5% in 1934). Even in the South at the height of Jim Crow, the Communist Party had a significant presence in Alabama. Despite the disenfranchisement of African Americans, the party gained 8% of the votes in rural Elmore County. This was mostly due to the successful bi-racial organizing of sharecroppers through the Sharecroppers' Union. Unlike open mass organizations like the Socialist Party or the NAACP, the Communist Party was a disciplined organization that demanded strenuous commitments and frequently expelled members. Membership levels remained below 20,000 until 1933 and then surged upward in the late 1930s, reaching 66,000 in 1939. The party fielded candidates in presidential and many state and local elections not expecting to win, but expecting loyalists to vote the party ticket. The party mounted symbolic yet energetic campaigns during each presidential election from 1924 through 1940 and many gubernatorial and congressional races from 1922 to 1944. The Communist Party organized by districts that did not coincide with state lines, initially dividing the country into 15 districts identified with a headquarters city with an additional "Agricultural District". Several reorganizations in the 1930s expanded the number of districts. The Communist Party has sought to play an active role in the labor movement since its origins as part of its effort to build a mass movement of American workers to bring about their own liberation through socialist revolution. As the prospects for such a social cataclysm have faded over time, the party has increasingly emphasized the ameliorative value of trade unions in capitalist society. From 1959 until 1989, when Gus Hall attacked the initiatives taken by Mikhail Gorbachev in the Soviet Union, the Communist Party received a substantial subsidy from the Soviets. There is at least one receipt signed by Gus Hall in the KGB archives. Starting with $75,000 in 1959, this was increased gradually to $3 million in 1987. This substantial amount reflected the party's loyalty to the Moscow line, in contrast to the Italian and later Spanish and British Communist parties, whose Eurocommunism deviated from the orthodox line in the late 1970s. Releases from the Soviet archives show that all national Communist parties that conformed to the Soviet line were funded in the same fashion. From the Communist point of view, this international funding arose from the internationalist nature of communism itself as fraternal assistance was considered the duty of communists in any one country to give aid to their comrades in other countries. From the anti-Communist point of view, this funding represented an unwarranted interference by one country in the affairs of another. The cutoff of funds in 1989 resulted in a financial crisis, which forced the party to cut back publication in 1990 of the party newspaper, the People's Daily World, to weekly publication, the People's Weekly World (see references below). Much more controversial than mere funding is the alleged involvement of Communist members in espionage for the Soviet Union. Whittaker Chambers alleged that Sandor Goldberger—also known as Josef Peters, who commonly wrote under the name J. Peters—headed the Communist Party's underground secret apparatus from 1932 to 1938 and pioneered its role as an auxiliary to Soviet intelligence activities. Bernard Schuster, Organizational Secretary of the New York District of the Communist Party, is claimed to have been the operational recruiter and conduit for members of the party into the ranks of the secret apparatus, or "Group A line". Stalin publicly disbanded the Comintern in 1943. A Moscow NKVD message to all stations on September 12, 1943, detailed instructions for handling intelligence sources within the Communist Party after the disestablishment of the Comintern. There are a number of decrypted World War II Soviet messages between NKVD offices in the United States and Moscow, also known as the Venona cables. The Venona cables and other published sources appear to confirm that Julius Rosenberg was responsible for espionage. Theodore Hall, a Harvard-trained physicist who did not join the party until 1952, began passing information on the atomic bomb to the Soviets soon after he was hired at Los Alamos at age 19. Hall, who was known as Mlad by his KGB handlers, escaped prosecution. Hall's wife, aware of his espionage, claims that their NKVD handler had advised them to plead innocent, as the Rosenbergs did, if formally charged. It was the belief of opponents of the Communist Party such as J. Edgar Hoover, longtime director of the FBI; and Joseph McCarthy, for whom McCarthyism is named; and other anti-Communists that the Communist Party constituted an active conspiracy, was secretive, loyal to a foreign power and whose members assisted Soviet intelligence in the clandestine infiltration of American government. This is the traditionalist view of some in the field of Communist studies such as Harvey Klehr and John Earl Haynes, since supported by several memoirs of ex Soviet KGB officers and information obtained from Venona and Soviet archives. [A]lthough purportedly a political party, [the Comunist Party] is in fact an instrumentality of a conspiracy [...] prescribed for it by the foreign leaders [...] to carry into action slavishly the assignments given [...]. [T]he Comunist Party acknowledges no constitutional or statutory limitations [...]. The peril inherent in its operation arises [from] its dedication to the proposition that the present constitutional Government of the United States ultimately must be brought to ruin by any available means, including resort to force and violence [...] as the agency of a hostile foreign power renders its existence a clear present and continuing danger. In 1993, experts from the Library of Congress traveled to Moscow to copy previously secret archives of the party records, sent to the Soviet Union for safekeeping by party organizers. The records provided an irrefutable link between Soviet intelligence and information obtained by the Communist Party and its contacts in the United States government from the 1920s through the 1940s. Some documents revealed that the Communist Party was actively involved in secretly recruiting party members from African American groups and rural farm workers. Other party records contained further evidence that Soviet sympathizers had indeed infiltrated the State Department, beginning in the 1930s. Included in Communist Party archival records were confidential letters from two American ambassadors in Europe to Roosevelt and a senior State Department official. Thanks to an official in the Department of State sympathetic to the party, the confidential correspondence, concerning political and economic matters in Europe, ended up in the hands of Soviet intelligence. When the Communist Party was formed in 1919, the United States government was engaged in prosecution of socialists who had opposed World War I and military service. This prosecution was continued in 1919 and January 1920 in the Palmer Raids as part of the First Red Scare. Rank and file foreign-born members of the Communist Party were targeted and as many as possible were arrested and deported while leaders were prosecuted and in some cases sentenced to prison terms. In the late 1930s, with the authorization of President Franklin D. Roosevelt, the FBI began investigating both domestic Nazis and Communists. In 1940, Congress passed the Smith Act, which made it illegal to advocate, abet, or teach the desirability of overthrowing the government. In 1949, the federal government put Eugene Dennis, William Z. Foster and ten other Communist Party leaders on trial for advocating the violent overthrow of the government. Because the prosecution could not show that any of the defendants had openly called for violence or been involved in accumulating weapons for a proposed revolution, it relied on the testimony of former members of the party that the defendants had privately advocated the overthrow of the government and on quotations from the work of Marx, Lenin and other revolutionary figures of the past. During the course of the trial, the judge held several of the defendants and all of their counsel in contempt of court. All of the remaining eleven defendants were found guilty, but the Supreme Court upheld the constitutionality of their convictions by a 6–2 vote in Dennis v. United States, 341 U.S. 494 (1951). The government then proceeded with the prosecutions of more than 100 "second string" members of the party. Panicked by these arrests and the fear that it was compromised by informants, Dennis and other party leaders decided to go underground and to disband many affiliated groups. The move only heightened the political isolation of the leadership while making it nearly impossible for the party to function. The widespread support of action against communists and their associates began to abate somewhat after Senator Joseph McCarthy overreached himself in the Army–McCarthy hearings, producing a backlash. The end of the Korean War in 1953 also led to a lessening of anxieties about subversion. The Supreme Court brought a halt to the Smith Act prosecutions in 1957 in its decision in Yates v. United States, 354 U.S. 298 (1957), which required that the government prove that the defendant had actually taken concrete steps toward the forcible overthrow of the government, rather than merely advocating it in theory. The Communist Party played a significant role in defending the rights of African Americans during its heyday in the 1930s and 1940s. The Alabama Chapter of the Communist Party USA played a highly important role in organizing the unemployed Black workers, the Alabama Sharecroppers' Union and numerous anti-lynching campaigns. Further, the Alabama chapter organized many young activists that would later go on to be prominent members in the civil rights movement, such as Rosa Parks. Throughout its history many of the party's leaders and political thinkers have been African Americans. James Ford, Charlene Mitchell, Angela Davis and Jarvis Tyner, the current executive vice chair of the party, all ran as presidential or vice presidential candidates on the party ticket. Others like Benjamin J. Davis, William L. Patterson, Harry Haywood, James Jackson, Henry Winston, Claude Lightfoot, Alphaeus Hunton, Doxey Wilkerson, Claudia Jones and John Pittman contributed in important ways to the party's approaches to major issues from human and civil rights, peace, women's equality, the national question, working class unity, socialist thought, cultural struggle and more. African American thinkers, artists and writers such as Claude McKay, Richard Wright, Ann Petry, W. E. B. Du Bois, Shirley Graham Du Bois, Lloyd Brown, Charles White, Elizabeth Catlett, Paul Robeson, Gwendolyn Brooks and many more were one-time members or supporters of the party and the Communist Party also had a close alliance with Harlem Congressman Adam Clayton Powell Jr. The party's work to appeal to African Americans continues to this day. It was instrumental in the founding of the Black Radical Congress in 1998. One of the most prominent sexual radicals in the United States, Harry Hay, developed his political views as an active member of the Communist Party. Hay founded in the early 1950s the Mattachine Society, America's second gay rights organization. However, gay rights was not seen as something the party should associate with organizationally. Most party members saw homosexuality as something done by those with fascist tendencies (following the lead of the Soviet Union in criminalizing the practice for that reason). Hay was expelled from the party as an ideological risk. In 2004, the editors of Political Affairs published articles detailing their self-criticism of the party's early views of gay and lesbian rights and praised Hay's work. The Communist Party endorsed LGBT rights in a 2005 statement. The party affirmed the resolution with a statement a year later in honor of gay pride month in June 2006. The Communist Party opposed the United States involvement in the early stages of World War II (until 22 June 1941, the date of the German invasion of the Soviet Union), the Korean War, the Vietnam War, the invasion of Grenada and American support for anti-Communist military dictatorships and movements in Central America. Meanwhile, some in the peace movement and the New Left rejected the Communist Party for what it saw as the party's bureaucratic rigidity and for its close association with the Soviet Union. The Communist Party was consistently opposed to the United States' 2003–2011 war in Iraq. United for Peace and Justice (UFPJ), currently the largest peace and justice coalition in the United States, includes the Communist Party as a member group, with Judith LeBlanc, who chairs the party's Peace and Solidarity Commission, being a member of the Steering Committee of UFPJ. According to the party site: "The Communist Party does not endorse candidates from other parties, but we are deeply involved in mobilizing people to participate in the elections". ^ a b "CPUSA Constitution". CPUSA Online. September 20, 2001. Retrieved October 30, 2017. ^ "Bill of Rights Socialism". CPUSA Online. May 1, 2016. Retrieved October 30, 2017. ^ Pierard, Richard (1998). "American Extremists: Militias, Supremacists, Klansmen, Communists, & Others. By John George and Laird Wilcox. Amherst, N.Y.: Prometheus Press, 1996. 443 pp. $18.95". Journal of Church and State. Oxford Journals. 40 (4): 912–913. doi:10.1093/jcs/40.4.912. Retrieved October 30, 2017. ^ "The name of this organization shall be the Communist Party of the United States of America.. Art. I of the "Constitution of the Communist Party of the United States of America". ^ a b Constitution of the Communist Party USA. CPUSA Online. 2001. ^ Harvey Klehr, John Earl Haynes, and Kyrill M. Anderson, The Soviet World of American Communism, Yale University Press (1998); ISBN 0-300-07150-7; p. 148. ^ Harvey Klehr, John Earl Haynes and Kyrill M. Anderson, The Soviet World of American Communism, Yale University Press (1998); ISBN 0-300-07150-7; p. 74. ^ She mentions James Barrett, Maurice Isserman, Robin D. G. Kelley, Randi Storch and Kate Weigand. ^ Ellen Schrecker, "Soviet Espionage in America: An Oft-Told tale", Reviews in American History, Volume 38, Number 2, June 2010 p. 359. Schrecker goes on to explore why the Left dared to spy. ^ Rose, Steve (January 24, 2016). "Racial harmony in a Marxist utopia: how the Soviet Union capitalised on US discrimination". The Guardian. Retrieved March 25, 2019. ^ Klehr, Harvey (1984). The Heyday of American Communism: The Depression Decade. Basic Books. pp. 3–5 (number of members). ^ Hedges, Chris (2018). America: The Farewell Tour. Simon & Schuster. p. 109. ISBN 978-1501152672. The breakdown of capitalism saw a short-lived revival of organized labor during the 1930s, often led by the Communist Party. ^ "User account - Gilder Lehrman Institute of American History". gilderlehrman.org. ^ Gentry, Kurt, J. Edgar Hoover: The Man and the Secrets. W. W. Norton & Company 1991. P. 442. ISBN 0-393-02404-0. ^ "New CPUSA Constitution (final draft)". ^ Klehr, Harvey; Haynes, John Earl; Gurvitz, David (February 15, 2017). "Two Worlds of a Soviet Spy - The Astonishing Life Story of Joseph Katz". Commentary Magazine. Commentary, Inc. Retrieved June 4, 2017. ^ Henry Felix Srebrnik, Dreams of Nationhood: American Jewish Communists and the Soviet Birobidzhan Project, 1924-1951. Brighton, MA: Academic Studies Press, 2010; p. 2. ^ "Opening of the Communist Party's 30th national convention". People's World. Retrieved June 16, 2014. ^ "Constitution of the CPUSA". June 2014. ^ a b "CPUSA Constitution". Amended July 8, 2001 at the 27th National Convention, Milwaukee, Wisconsin. Retrieved November 11, 2011. ^ a b c "Communist Party Immediate Program for the Crisis". Archived July 8, 2009, at the Portuguese Web Archive. Retrieved August 29, 2006. ^ a b c d e f g h i j "Program of the Communist Party". ^ See Karl Marx, The Communist Manifesto, Chapter 2. ^ "War Will Not End Terrorism". CPUSA Online. October 8, 2001. Retrieved April 6, 2009. ^ Myles, Dee. "Remarks on the Fight for Women's Equality". Speech given at the 27th National Convention of the CPUSA. Communist Party USA. CPUSA Online. July 7, 2001. Retrieved April 7, 2009. ^ Trowbdrige, Carolyn. "Communist Party Salutes Women". CPUSA Online. March 8, 2009. Retrieved April 7, 2009. ^ Section 3d: "The Working Class, Class Struggle, Democratic Struggle, and Forces for Progress: The Working Class and Trade Union Movement Democratic Struggle and its Relation to Class Struggle Special Oppression and Exploitation. Multiracial, Multinational Unity for Full Equality and Against Racism". CPUSA Online. May 19, 2006. Retrieved April 7, 2009. See also The Communist Party and African-Americans and the article on the Scottsboro Boys for the Communist Party's work in promoting minority rights and involvement in the historically significant case of the Scottsboro Boys in the 1930s. ^ García, Mario T. Mexican Americans: Leadership, Ideology, and Identity, 1930–1960. New Haven, Conn.: Yale University Press, 1991. ISBN 0-300-04984-6, ISBN 978-0-300-04984-8. ^ "CPUSA Constitution". Amended July 8, 2001 at the 27th National Convention, Milwaukee, Wisconsin. Retrieved August 29, 2006. See also Executive Vice Chair Jarvis Tyner's ideological essay "The National Question". CPUSA Online. August 1, 2003. Retrieved April 7, 2009. ^ a b "What are the CPUSA views on the environment?". CPUSA Online. July 1, 2003. Retrieved April 5, 2009. ^ "What about the Communist Party and religion?". CPUSA Online. Retrieved January 29, 2012. ^ a b "Communist Party votes by county". depts.washington.edu. Retrieved July 20, 2017. ^ a b Kelley, Robin D.G. (1990). Hammer and hoe : Alabama Communists during the Great Depression ([2nd ed.]. ed.). Chapel Hill: University of North Carolina Press. pp. 2–10. ISBN 0-8078-1921-2. ^ "Communist Party Membership by Districts 1922-1950". ^ This claim is made on the personal site of Joseph T Major. Retrieved August 30, 2006. He cites it to Harvey Klehr, John Earl Haynes and Kyrill M. Anderson in The Soviet World of American Communism, Yale University Press (1998), ISBN 0-300-07150-7, Document 45, p. 155. The text of a $3 million receipt dated March 19, 1988 is given on the site, but the receipt is not reproduced. ^ Chambers, Whittaker (1987) . Witness. New York: Random House. p. 799. ISBN 978-0-89526-789-4. ^ a b Haynes, John Earl, and Klehr, Harvey, Venona: Decoding Soviet Espionage in America, Yale University Press (2000). ^ Schecter, Jerrold and Leona, Sacred Secrets: How Soviet Intelligence Operations Changed American History, Potomac Books (2002). ^ Sudoplatov, Pavel Anatoli, Schecter, Jerrold L., and Schecter, Leona P., Special Tasks: The Memoirs of an Unwanted Witness – A Soviet Spymaster, Little Brown, Boston (1994). ^ "Title 50 > Chapter 23 > Subchapter IV > § 841. Findings and declarations of fact". U.S. Code collection on the site of Cornell University. Retrieved August 30, 2006. ^ Retrieved Papers Shed Light On Communist Activities In U.S., Associated Press, January 31, 2001. ^ Weinstein, Allen, and Vassiliev, Alexander, The Haunted Wood: Soviet Espionage in America – the Stalin Era (New York: Random House, 1999). ^ Mink, Gwendolyn, and Alice O'Connor. Poverty in the United States: An Encyclopedia of History, Politics, and Policy. ABC-CLIO, 2004, p. 194. ISBN 1-57607-597-4, ISBN 978-1-57607-597-5. ^ "In this issue...", Political Affairs, April 2004. Retrieved August 29, 2006. ^ "Gay Pride Month: Communists stand in solidarity". CPUSA Online. June 24, 2006. Retrieved August 20, 2012. ^ "No to Bush's War!". CPUSA Online. Archived on the Internet Archive on April 7, 2003. ^ "C. E. Ruthenberg Page". ^ "The James P. Cannon Library". Arnesen, Eric, "Civil Rights and the Cold War at Home: Postwar Activism, Anticommunism, and the Decline of the Left", American Communist History (2012), 11#1 pp 5–44. Draper, Theodore, The Roots of American Communism. New York: Viking, 1957. Draper, Theodore, American Communism and Soviet Russia: The Formative Period. New York: Viking, 1960. Draper, Theodore, The Roots of American Communism. New Brunswick, New Jersey: Transaction Publishers (Originally published by Viking Press in 1957). ISBN 0-7658-0513-8. Howe, Irving and Lewis Coser, The American Communist Party: A Critical History. Boston: Beacon Press, 1957. Isserman, Maurice, Which Side Were You On? : The American Communist Party During the Second World War. Wesleyan University Press, 1982 and 1987. Jaffe, Philip J., Rise and Fall of American Communism. Horizon Press, 1975. Klehr, Harvey. The Heyday of American Communism: The Depression Decade, Basic Books, 1984. Klehr, Harvey and Haynes, John Earl, The American Communist Movement: Storming Heaven Itself, Twayne Publishers (Macmillan), 1992. Klehr, Harvey, John Earl Haynes, and Fridrikh Igorevich Firsov. The Secret World of American Communism. New Haven: Yale University Press, 1995. Klehr, Harvey, Kyrill M. Anderson, and John Earl Haynes. The Soviet World of American Communism. New Haven: Yale University Press, 1998. Lewy, Guenter, The Cause That Failed: Communism in American Political Life. New York: Oxford University Press, 1997. Ottanelli, Fraser M., The Communist Party of the United States: From the Depression to World War II. New Brunswick, NJ: Rutgers University Press, 1991. Palmer, Bryan, James P. Cannon and the Origins of the American Revolutionary Left, 1890–1928. Urbana, IL: Illinois University Press, 2007. Service, Robert. Comrades! : a history of world communism (2007). Shannon, David A., The Decline of American Communism: A History of the Communist Party of the United States since 1945. New York: Harcourt, Brace and Co., 1959. Starobin, Joseph R., American Communism in Crisis, 1943–1957. Cambridge, MA: Harvard University Press, 1972. Zumoff, Jacob A. The Communist International and US Communism, 1919-1929. Chicago: Haymarket Books, 2015. Note that the number of articles, pamphlets and books directly or tangentially relating to communism in the United States and the CPUSA is vast, numbering into the thousands of titles. For a selection of the most important titles, see bibliography on American Communism. "Communist Party of the United States of America Records". Tamiment Library & Robert F. Wagner Labor Archives. New York University. 1892-2009. "Communist Party of the United States of America Records". 1956–1960. 100 items. "Communist Party of the United States of America, Washington State District Records". 1919–2003. 8.93 cubic feet (12 boxes). "Marion S. Kinney Papers". Circa 1941–1981. 18 cubic feet and 1 sound tape reel. "The Radical Pamphlet Collection". The Library of Congress has materials from the Communist Party USA. Wikimedia Commons has media related to Communist Party USA.